He He He.......did you see in the background of my first pic a 16v head gathering dust? LOL.. Sorry I mean to say a New 2.0ltr Heads and have them ported to a 2.2Ltr?? The Engine is a M type! And I have too keep this into more of a Sleeper car.. Damn Laws here can get my car pulled of the road now! If they are mod from non factory orignal part's! But they would have to Catch me 1st!! Teeeheee.. LOL.......... I NEED NITRO's!! How strong are the rods and crank on the 2.2 DOHC motor? If there any stronger than the 2.0 then my motor might become a 2.2, lol I really want to get my hands on some C20XE or C20LET rods cause I hear there stronger than the 2.0 rods I'm not sure about the crank though, I wanna streangthen up my bottom end a little but I cant think of any ways to do it, my only plans for the bottom end now are APR rod bolts. Stef, how much do you think it would cost to get some C20LET or XE rods over to canada? I bet its way to expensive but I'm curious cause four rods cant weigh that much. And is the crank diffrent than a 2.0 SOHC crank? I'm looking to get some serious power out of this motor and I dont really feel safe running stock bottom end. slowolej, I'm not really in a huge hurry to get this done I got a few more projects on the go right now but I'm going for the parts April 30 so I just need to know what I need soon, but I got it all figured out except the ignition thing. I know a guy who can re program computers and stuff so could I change the ECU that way? and if your not to busy could you dig up the exact numbers for the calibration I'm in no hurry for that cause I'm still collecting parts for my car before I pull it apart, I wanna do the hole motor at once and drop it in and be done with it. I still need quite a few more things so I want be doing the computer for a while. Yes, and I'm sooo jealous. Talk about a bunch of nonsense! The easiest way to change these values is with a hex editor. They are in hex, of course. If your guy's used to speaking hex or binary, those instructions will make sense. The terms beginning with KK are variable names as taken from some GM documentation. There are various disassemblies and other files on the 'net which relate to the 7749 ecm and use these variable names. These numbers should also work for the 2.0 OHC DIS block, as well as the 60 degree V6, 2.5 and possibly 2.3 liter engines. Don't forget to correct (or disable) the checksum after modifying the file with the hex editor! There, now they're in the jbo archives. Wow, it's getting pretty high tech in here! Hex codes, DOHC swaps, DIS conversions, custom exhaust manifolds, espionage at Isuzu dealers, spy photos of Stef's garage, etc. Can we get back to easy stuff like turning the boost up or making a CAI? LOL. Off subject but it has been on my mind - Tyrin who is the blond from your avatar? Not the current one, the last one? Sorry, I have to know!! The crank and rods on the Daewoo DOHC engines are based on the 8v items complete with press fit pins. I wouldn't say they were any stronger than your stock items. This is a picture of the 16v XE rod (on the left) next to a euro 8v rod (I am presuming they are the same as yours). You can find rods on www.ebay.co.uk. Set up a couple of favourite searches for "vauxhall conrods", "vauxhall 16v", etc. You'll get emailed anytime something new comes along. Just trawl through and your bound to find some rods, they pop up on a regular basis. If you have any problems with shipping I can always send parts out to you like I have done with Tony in the past. I expect the cost would be around £50-£60 GBP via airmail for conrods. They would take a week (give or take a few days) to turn up on your doorstep. The 16v cranks seem to be based on the same casting but they have extra fasteners either end of the crank i.e. the flywheel end has eight bolts and the accessory drive end has six bolts. The extra bolts were added because of the extra power the 16v is capable of producing. There are two types of crank used on the 16v and the 8v here. They are early and late (lol). The early type are much lighter and have less counterweights. The late type is basically the same as the Daewoo type and is heavier. I'll see if I can dig out some pictures from somewhere. Thanks for all the info, this thread is getting pretty technical, lol most I've learned from one thread in a long time also, I'm not sure if I asked this yet or not but will the intake or exhaust manifold from a 8v motor fit on a 16v head, or will I have to make a new exhaust manifold to turbo it. I hang out with the raised-with-carburetor guys, and when I pull out the laptop they all run for cover. I hang out with the engineer and computer type guys, and when I pull out the ball pein hammer they all run for cover. Fine. After reading some articles about the Ecotec, I think that's the engine to have. I think it would be really kewl installed in a turbo 'bird. Up to 14 psi is available with only chip modifications! Some work to the timing and fuel tables can greatly improve driveability and response. You can get into burning your own chips, or have someone do it for you. With a switch to Syclone/ Typhoon "3 bar chip," a 3 bar MAP sensor, and an investment of time transferring the 4 cylinder data from your original calibration to the Syclone calibration, you could run up to 30 psi under factory ecm control! For anyone else, especially anyone interested in alternative powerplants, GM actually marked a 2.0L Marine engine for about a year, which looked remarkably like the OHC LT3 engine. GMPowertrain currently offers a 1.6L industrial engine which is also similar to the LT3 engine, but uses an intake similar to what I've seen pictured on Vauxhall engines. I think I need to find one of those 1.6L valve covers. Also, just playing around with some numbers, it looks like the Isuzu 2.2L engine's 9.6:1 compression ratio could be reduced to a turbo friendly 8.7:1 by using the 2.0L crankshaft. Sure, you lose about 10% engine displacement, but it's more than made up for with the turbo. Man, GM is really getting their money's worth from this engine design huh? You're right Shannen that intake does look like one of those dime-a-dozen Vauxhall ones Stef uses as a door stop. Too bad it'd be tough to use on an LT3. I'll bet it flows decent. Amber Michaels huh Tyrin? Thanks. Gotta head to Limewire now! Stef, I got a few more Q's for you, or anyone else who knows. Does the C20LET have forged pistons? Whats the factory compression ratio of a C20LET? and just out of curiousity how much hp does a stock C20LET have? Tyrin, the C20LET does have forged pistons (made by Mahle - no longer available from GM). 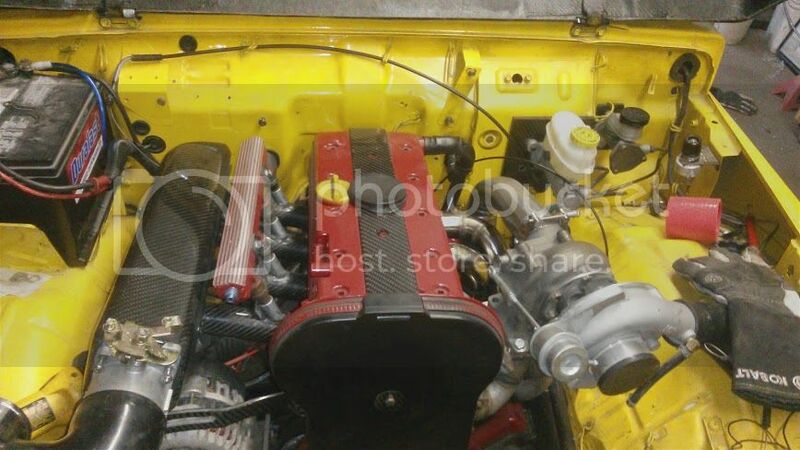 The LT3 exhaust and intake manifolds won't bolt up to the 16v head btw, you'll need to either fab your own manifolds or modify the existing ones. Everything you want to know about the C20LET can be found here Compression ratio IIRC is 9:1, the new Z20LET engines are 8.8:1 and use cast hypereutectic pistons. The latest version of the 2.0L DOHC engine used in the new VXR range of Opel/Vauxhall cars have a stiffer block, stronger crank and rods and for the first time oil squirters for under piston cooling. I don't know yet the interchangeability of the parts with the older OHC engines as yet.......well I know I can use the pistons on the older XE rods, but that's about all for now. That industrial engine is what we call a "small block" GM engine, commonally used in Opel/Vauxhall Nova, Corsa, Astra and Kadetts in europe, in Holdens down under and in Chevys in South America. The valve cover and intake are not interchangeable with the larger 1.8 or 2.0L OHC engines. Intakes like the one on the industrial engine are commonally used on the 2.0L OHCs around the rest of the world. They come with a 56mm TB stock and can be fitted with TB's up to 65mm from larger GM cars. The intakes are dirt cheap and ten a penny over here. This pic is of a better flowing Irmscher version, though it looks the same as stock. I should have pics of the different cranks tomorrow btw. Oh, with regards to the intake manifold, whilst they perform well on a N/A engine, I'm not sure how they will do on a turbocharged one. The runners are longer than the stock LT3 piece, the plenum is also smaller. There may be issues with the left hand runner and cylinder running too rich and the right hand runner and cylinder running lean due to the TB being placed on the end of the plenum and there not being (in my opinion) enough distance from the runners.